1 Nov 2018 – President Donald Trump has announced that he plans to automatically deny asylum rights and detain migrants entering the United States illegally between the designated ports of entry—his latest response to the migrant caravan approaching the southern border. “These migrants are not legitimate asylum seekers,” Trump said during remarks on immigration reform at the White House today. The president added that as of a few days ago, asylum seekers will be detained in “massive tent cities” until their hearing takes place or they are deported instead of being released into communities. But immigration and legal experts say the move could be illegal, as the president would be breaking both federal and international law. Under the 1967 Protocol Relating to the Status of Refugees, an international treaty agreed to and signed by the United States, participating nations cannot deny people fleeing persecution from trying to apply for asylum. So far, the U.S. has satisfied its end of the agreement by allowing migrants to present themselves at the border or at airports and giving them the opportunity to demonstrate that they are in need of protection. Along with international obligation, the federal government is also bound to allow migrants to apply for asylum by statutes in the Immigration and Nationality Act. That doesn’t mean that Trump has to grant asylum to everyone who applies, but migrants who fear persecution in their home countries are welcome to apply and given a credible fear interview. “In order for [Trump] to do what he is proposing, he would have to get the U.S. to withdraw from the obligations under international protocol and he would have to get Congress to change immigration procedures by passing new legislation,” Hing said. But the president said that he will issue the plan through an executive order sometime next week. Hing added that Trump’s plan would be immediately challenged in court and that the challenge would likely be successful. The Supreme Court has cited international protocol as obligating the U.S. to adhere to a “particular standard” when it comes to asylum-seeking migrants, Hing noted. In one Ronald Reagan-era case, the president’s administration had attempted to cut asylum hearings in Florida to under 15 minutes. But federal courts shot the plan down, saying that it was a violation of protocol. Ben Johnson, the executive director at the American Immigration Lawyers Association, agreed with Hing that Trump’s proposal would invite several legal challenges. When asked if the president has the power to bypass Congress or international law, Johnson said that recent immigration policies have left that answer unclear. “The Muslim ban was a new application of the president’s authority in the immigration realm and I don’t know what he can do to expand the authority that the Supreme Court recognized in that case,” he said. The president’s travel ban, the third iteration of which was upheld by the Supreme Court, was widely derided as a “Muslim ban” by critics for its focus on Muslim-majority nations and the fact that Trump during his campaign had called for a total ban on Muslims entering the U.S. 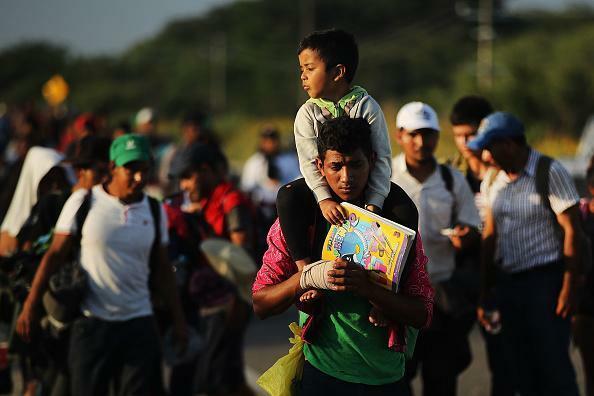 This plan to deny asylum to migrants illegally entering the U.S. in between the designated ports of entry could be an attempt to dissuade migrants from coming at all, Muzaffar Chishti, the director of the Migration Policy Institute at New York University School of Law, told Newsweek. The ploy would be fitting with the Trump administration’s continued hardline immigration policies. Chishti said that asking migrants to show up at specific entry points is a “fine management response” but that the Trump administration cannot repeat the mistakes that were made in implementing their “zero-tolerance” policy that resulted in family separations. “If we make an announcement, we have to be prepared with an infrastructure that supports it,” Chishti said. There is going to be a large number of people lining up at the entry points and many with children. “What kind of mechanisms have we put in place to deal with that?” Chishti questioned. Trump reiterated his position today. As if Trumpet has the slightest interest in legality, or decency or international laws, or people who are not rich and pandering to his violent policies. Now he has troops in the border with Mexico, rolling out barbed wire to catch the “evil invaders” who are the result of his predecessors’ destruction of their countries.